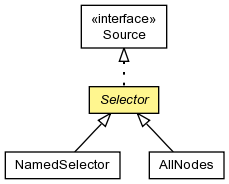 Create a selector with a name. Create a selector with the supplied name and alias. Get the alias name for this source, if there is one. Get the alias if this selector has one, or the name. Determine if this selector has an alias. Get the name for this selector. the alias name, or null if there is none. true if this selector has an alias, or false otherwise.